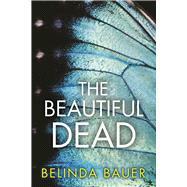 Belinda Bauer is an award-winning British crime writer of the highest caliber, whose smart, stylish novels have captivated readers and reviewers on both sides of the Atlantic and earned her a reputation as the true heir to the great Ruth Rendell” (Mail on Sunday (UK)). Her latest, The Beautiful Dead, is a riveting narrative centered on a down-on-her-luck journalist and a serial killer desperate for the spotlight. TV crime reporter Eve Singer’s career is flagging, but that starts to change when she covers a spate of bizarre murderseach one committed in public and advertised like an art exhibition. When the killer contacts Eve about her coverage of his crimes, she is suddenly on the inside of the biggest murder investigation of the decade. But as the killer becomes increasingly obsessed with her, Eve realizes there’s a thin line between inside information and becoming an accomplice to murderpossibly her own. Belinda Bauer is the author of six previous award-winning novels which have been translated into twenty-one languages. She won the Crime Writers’ Association’s Gold Dagger Award for Crime Novel of the Year for Blacklands, the Theakston's Old Peculier Crime Novel of the Year Award for Rubbernecker, and the CWA Dagger in the Library Award for outstanding body of work. She lives in Wales.